The definition of LUXURY! 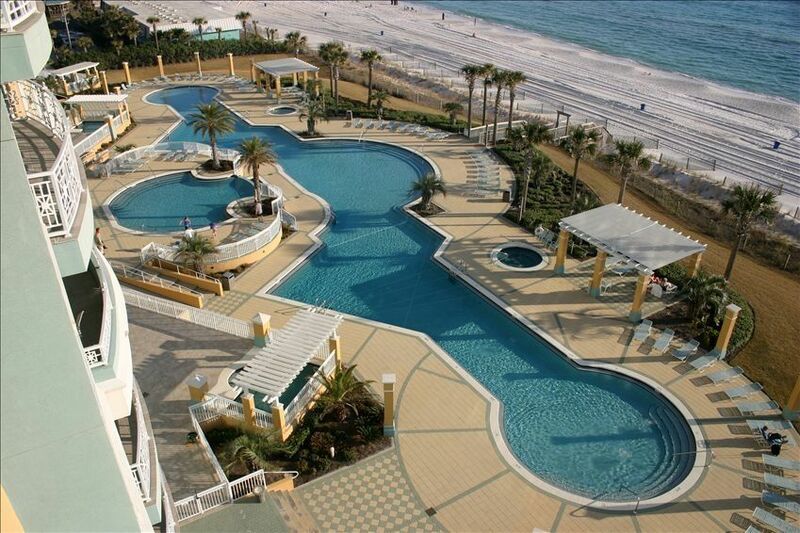 En Soleil is the newest condominium in Panama City Beach and the most opulent. This condominium has everything you are looking for in beachfront elegance. Park under the building to protect your vehicle and take the elevator up to your dream accommodations. You will find only three condominiums per floor and your condominium luxuriously furnished with fine furniture and every convenience available. Enjoy an unobstructed view of every sunset from the comfort of the balcony, living, or bedrooms. After sunset, relax while watching one of four televisions with cable TV or throw a DVD into one of three DVD players. With four TVs, everyone can find something to watch. Prepare a gourmet meal on the granite countertops using the state-of-the-art, stainless-steel appliances including a convection/microwave oven, refrigerator with filtered-water dispenser, and separate, large, ice maker. Or, you may want to step out on the huge, 531-square-foot balcony that includes a summer kitchen. Minimum Age Requirement for this condo is 26. Comfortable occupancy is six (6) adults and four (4) children under the age of 13. Mark an I bought our condo, as a 2nd home, in 2003 when our third son was born. Our family, immediate and extended, loves coming to the condo for the luxury, relaxation and beauty that everyone feels when they stay at En Soleil. Mark is a developer/builder in Powder Springs, Georgia, about 20 miles northwest of Atlanta. I am a healthcare recruiter for HCA TriStar Division and I recruit RN's for hospitals in GA. We love relaxing at the condo and enjoy sharing our home with our guests! Bring your family and friends and come be our guests! One reserved parking space underground right next to elevators. Additional parking in parking lot in front of building. All parking is within a 24/7 security force. Parking for boat,jet ski,trailer, etc. within security gates of complex. Homemade ice cream maker, waffle maker, blender, cake mixer. 537 sq. ft. summer kitchen with table for six and four chase lounge chairs and cocktail tables.